We are the first to import this fantastic product direct from Mae Pranom, the freshest and most delicious 'Prik Pao' you will ever taste. This is the 'Yellow Label' that Mae Pranom makes for the local Thai market. 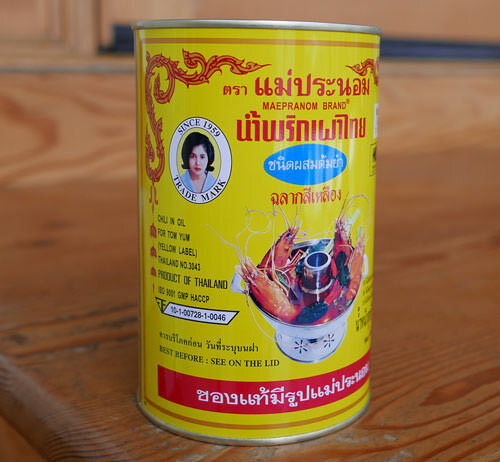 It's made specifically for Tom Yum Goong but we find it's great just spooned over freshly steamed rice (then mixed to incorporate the prik pao into all of the rice) or added when making fried rice. We like it as a simple dip for fresh vegetables. "Namprik Pao Thai • Tom Yum Type • Yellow Label • Especially to mix in Tom Yum • Mae Pranom Brand • Made with raw ingredients chosen from a clean facility • It's very good for: Mix in tom yum shrimp, chicken, fish, shrimp yum salad • stir-fried clam • stir-fried shrimp • stir-fried crab • stir-fried fresh squid • mix in any recipe to improve the flavor of your dish • perfect for restaurant use or any food vendor, hotel or in your household pantry • no preservatives." You get 32 oz of prik pao in each can, so this is a large quantity and allows for generous use. On a per-ounce basis, this is less expensive than our 8 oz jar of white label prik pao. The top opens up like a paint can, just use the handle of a spoon to pry it up. The Prik Pao is packed inside the can, in a modern, strong plastic pouch (see picture below). Just open the pouch and pour it back into the can for storage in your pantry. Makes a fantastic gift for any Thai person you may know, as this is very rare in USA aside from our shop. We've never seen it offered before outside of Thailand. Ingredients: sugar, salt, vegetable oil, onion, garlic, dried chilli, dried shrimp, tamarind, shrimp paste. No preservatives. Made in Thailand. Thai Prawn Soup With lemon grass, "Tom Yum Goong"
Cracked Crab Thai Curry "Bu Pad Pong Kari"
Stir-fried Squid in Chile, "Plamuk Pad Namprik Pao"
Fried Sticky Rice, "Kao Neeo Tod"
Thai Fried Clams in Roasted Chile Paste, "Hoy Lai Ped"